1) Season loin with salt and pepper. Heat oil in a medium skillet over medium-high. Add loin and sear on all sides, about 10 minutes total, turning as needed. Remove loin from skillet; place on serving platter and cover. 2) Add onions to skillet; cook until softened, about 5 minutes, stirring. Add remaining ingredients; bring to a boil over high heat. Simmer until sauce has thickened, stirring, about 3 minutes. 3) Slice loin into thin cutlets; pour sauce over and serve immediately. This was awesome!! Could taste every ingredient, nothing over-powered the other. Full of flavor definetly would recommend it to anybody. 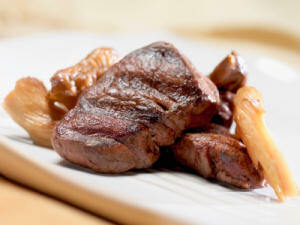 If you have someone who doesn't like venison give this a try pretty sure you'll fool them. Tenderized and marinated in all the ingredients for two days first. Wife couldn't get enough.